Ordinary Life Magic: August 11: I Want My Two Dollars!! August 11: I Want My Two Dollars!! Yesterday I had big, big plans for my day. I was going to clean house. Flow through and into Being. But upon discovering (Aubrey is going to think I am blaming her for this) that The Museum of Ancient Life was having a ten thousand percent discount on admission prices (now $2) we headed south to spend the day at the museum and nearby garden. I wish I had a photo to show you. I imagine it would resemble the sad, sad line should someone have put up a sign a few weeks ago that said "Get Your Swine Flu Shots Here. Two Bucks." In our defense,we supposed that TWO DOLLAR TUESDAYS! had been going on all summer. That's what, fourteen? weeks to spread out the love. Not quite. Turns out, only in August. Thus the Swine Flu Lines. Of course we had better sense than to wait in that line and then actually go inside under those conditions. So we had driven a half hour south on the interstate to sit on the grass. And then an hour or so later we considered that we had driven a half hour south on the interstate to sit on the grass, and took a peek at the lines. Hey!, we thought (some might say optimistically, others would call it desperately), the line is much shorter! It surely must be alright, now!! Now, you know better, don't you? Of course you do. You'd think at this point that we were newbie homeschoolers or something. Used to Saturday In Freedom crowds. Accustomed to waiting in long lines for a turn at something. Used to doing something in an orderly fashion, and not having the absolute comfort of visiting all the museums within fifty miles and knowing them backwards and forwards, so much that in usual circumstances, a Mama doesna worry when she doesn't see a familiar babe right away (in the first quick scan). Used to whistles blown at us, water taken away, and shouted at to Spit out that gum! So we go when we can go and live in freedom. We're used to it that way. We're spoiled enough to accept it as the only way. I could show you a couple of pictures of the museum... I was able to get close enough once or twice to a thing without someone irritating getting in my shot. I could tell you that in truth the whole day wasn't so bad. And it had its moments of Acceptable, to be sure. And we got to see our friends. ...and that's about all I've got. Because the very best part of the day was probably rolling and running down the hill. You know that song, don't you? I can't help but think that I want a refund of my day. The whole day -including the farm with the animals standing on gravel and the pretty oh-so-manicured gardens- was pretty convoluted and contrived and not very satisfying. But I guess life is still pretty good. Just not on a Two Dollar Tuesday. Oh my goodness...I'm so sorry you witnessed throngs. We're not good with lots of people, disobeying rules of the museum, shuffling their kids through exhibits & half-heartedly answering their inquiries. UGH. I love back to school time, when the crowds disappear and we get the places to ourselves again! BTW, remind me the movie this comes from. I remember saying "I want my 2 dollars" back in the day, but I can't remember the movie. Jon Cusack? Thanks you for the love and hugs on my blog. It is well appreciated. Looks to me like a nightmarish situation turned out pretty decent by lots of rolling down hills. I'm impressed that you had the "courage" to go in; I would have RAN the other way, jumped in the car and took off. Hope today is a little less crowded. Wow, Thanks so much for releasing me from my guilt of not getting around to taking "advantage" of those discount museum Tuesdays. (We have them too.) You have made me realize something I think I must have known instinctually. I will stick to what we have been doing...paying full price. It IS worth it. Oh we take full advantage of discounts, don't get me wrong!! 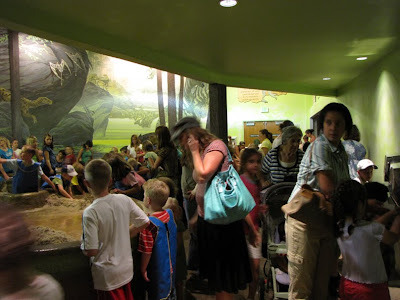 The first Monday of every month is free at our natural history museum, and also with our Aviary membership we get the first THursday free at lots of reciprocating places (zoo, museums, etc). HRMJ- Yup, Cusak, Better Off Dead. Had to call dh and ask him. It has been so much easier for me now that i am taking Ellie to places like this while school is in. It just ruins everything having to squeeze around everyone. Sometimes cheap day can be a good reason to stay home! That photo - phew! Not funny! oh, yuck. That's the way we feel about the beach on weekends. We avoid them, being spoiled by having the place to ourselves most weekdays. This is one of my favorite posts by you! lol Such a great post for unschoolers. Sarah- I knew you'd get my humor. Melissia - yours took me a minute!! In the movie Better Off Dead the paperboy has a switchblade comb. It is really funny.